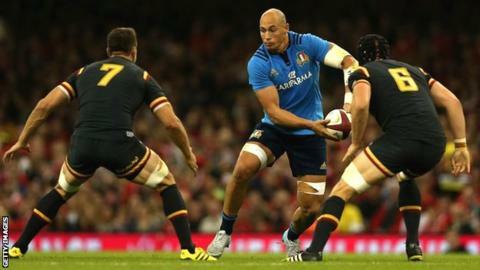 Italy captain Sergio Parisse will miss his country's opening Rugby World Cup game against France next weekend. The Argentina-born number eight, 31, has not fully recovered from surgery to drain a haematoma - an injury sustained in Italy's 23-19 World Cup warm-up defeat by Wales last weekend. Parisse was operated upon on Monday but team manager Luigi Troiani confirmed he will be unavailable at Twickenham. "We hope he will recover for the [next] match with Canada," said Troiani. The haematoma, a swelling of clotted blood, developed in Parisse's left calf after the match in Cardiff. The news comes as a blow to the Italians' chances against France, with their captain widely considered to be their best player. He has won 113 international caps and played at the last three Rugby World Cups.